It’s coming up for about a year since I started writing here (somewhat) regularly. At the time I didn’t post any chatty ‘here’s me and here’s why I’m here’-type post, because I couldn’t do it without it becoming long-winded, and because it’s really not very interesting, and because attempting it was becoming a barrier to writing the things that potentially were interesting. I enjoy reading bloggers who do a chatty life update with every post, but it’s not for me usually – I prefer to get on with whatever idea is in my head while I’ve got the chance. So this is a rare bit of backstage banter. It’s been pointed out to me recently that this blog might have a bit of an identity crisis, as I bounce around between some diverse categories. Much of the plethora of online advice surrounding becoming a ‘successful blogger’ focuses on finding a niche – one hook that readers can hang their hat on – and sticking to it consistently. Of course there’s truth in this – when I subscribe to a beauty blog, or a travel blog, or a sewing blog, it’s because I want to look forward to regular articles I know I’ll be interested in. 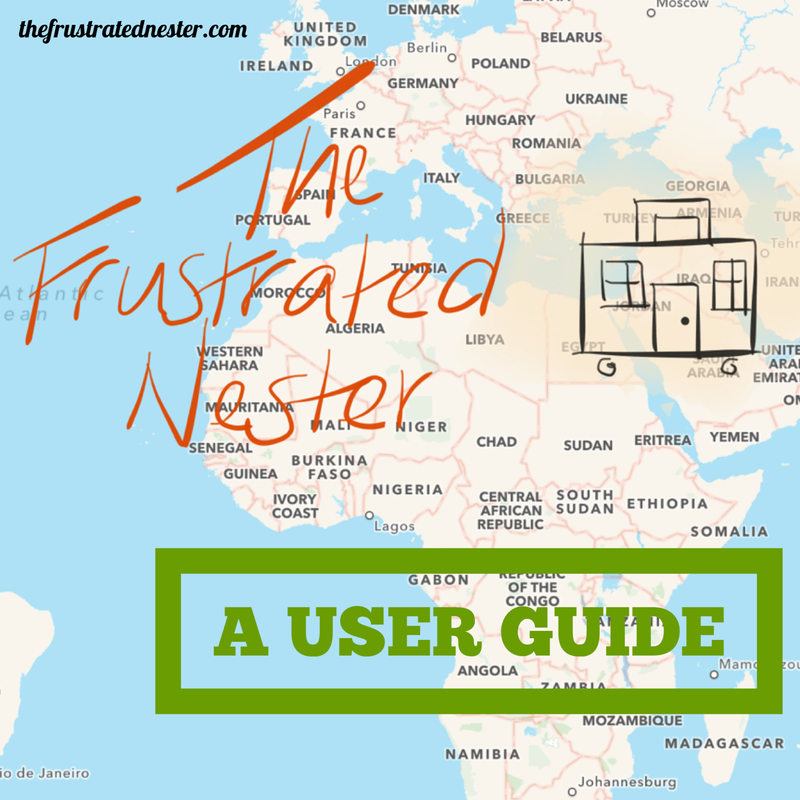 The title, ‘The Frustrated Nester’, came about long before I actually realised the blog itself, and originally had a niche idea behind it. I wanted to avoid being just another expat spouse blogger, and had the idea of focusing on how always moving around conflicted with my long-held nesting instinct – the tricks I use to make each pitstop feel like home, and the mental notes I was always taking along the way for what I would do in my our forever home. Once I got going though, I found I was more interested in sitting down and writing than in taking pretty pictures of home projects. (Not to mention that I started following this blog, which does it spectacularly well and much more prettily than I could ever be bothered with.) Earlier this year we actually bought the forever house, so I’m a less frustrated nester than when I started. It’s still a good name though, right? There have been moments I’ve become concerned about my lack of niche. Those moments usually come when I’m pondering my WordPress stats, or wondering why my ‘reach’ bar on facebook posts is at a certain level, or ungraciously thinking ‘why does that shallow, insubstantial, nothing-but-supposedly-inspirational-quotes waste-of-space Instagram account have several thousand followers compared to my several dozen’? Luckily, those moments are short when I remind myself that being a ‘successful blogger’ is not my goal. I’m not here to increase my reach or monetise or boost my SEO (all of which I know are things since I started a blog). I’m here to write regularly for an audience, to explore my skills, develop a voice and see where it takes me. So my niche is my writing. I do make use of categories, which I’ve streamlined recently, and I add tags to help people who might be interested in what I have to say find me. I’ve added a picture of myself and a friendlier ‘about’ page to help people who do find me feel comfortable enough to stick around in my corner of the internet. But I write what I want to write, what I think some people might enjoy reading, rather than using content to create the biggest following I can. And it’s fun! If you read something and it does nothing for you, no worries, move along, thanks for dropping in this time! If you read something and it raises a smile, or a nod of recognition, or you just appreciate the way I’ve put the words together, please click ‘like’! (Here, or on facebook, or Instagram.) Or even better, leave a comment! If you read something and – as people often very gratifyingly tell me – it really chimes with your own experience, or gives you a fresh perspective, or makes you laugh out loud, then why not go ahead and share it? (Ideally adding a word or two of introduction.) If it speaks to you, chances are it will speak to at least one other person you know. And you’d be doing me a little favour in return for my brightening your day! More readers = more motivation. Here’s another reason I don’t do chatty posts. Now I feel I have to say goodbye in a neat and snappy way. Umm…thanks for dropping by…happy travelling/expatting/sewing/writing/whatever your thing is…bonne soirée…have a great weekend peeps (‘peeps’?? this is getting awkward…) Normal service will resume shortly. I love your craft projects and it definitely strikes a cord with my inner creativity. I’m very good at pinning ideas on Pinterest but they very rarely progress. It’s encouraging to see you just cracking on with it. Any tips to exit procrastination would be greatly received, Thanks! Good to know! Thanks for the feedback! I have been experimenting lately with a web-blocking app called Freedom – mainly so I can get offline when I’m trying to write. Will let you know how it goes! Glad I found this post. I can totally relate. I hope you continue blogging! Thanks so much Rhonda! I’m glad you found it too! More posts are in the offing after a long summer-holiday hiatus!